Character Meals in Walt Disney World can be a tricky thing to figure out. Luckily, our Disney Food for Families columnist, Erin Foster, created a great breakdown to help you decide exactly which character meal is going to fit your family’s needs! 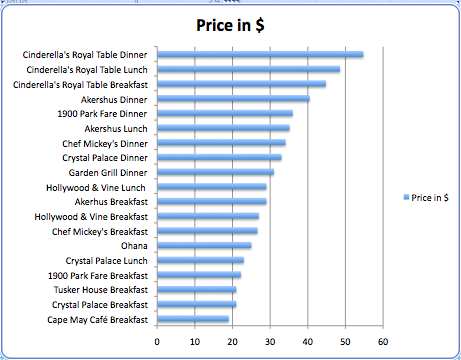 Below is a chart depicting how character meals compare by price. A key factor not represented on the chart below is the cost of theme park admission. For all of the meals at restaurants located within the parks, you would need to add the price of theme park admission media. The price charted is for a single adult meal. Child prices generally increase as adult prices do. See our Disney World Character Meal page for more information and to compare character meals for your family.